Super engaging math puzzles that systematically teach kids algebra and other higher math skills. This app turns learning algebra and other mathematics into a series of fun puzzles. For each puzzle, kids are presented with a play area that has two sides. 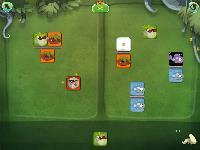 The object of the puzzle is to use special cards (which each have math rules) to isolate the square Dragonbox so that it is alone on one side. The cards are slowly introduced and their rules explained in visual tutorials. Kids then experiment with adding and combining cards in ways to segregate the Dragonbox (which represents solving "x" in an algebraic equation). By solving this series of increasingly complex puzzles, players learn algebra, fractions, factorization, distribution, and other math concepts. The 357 puzzles are broken into 20 chapters; and in each, kids receive feedback as they play. This app is so brilliantly designed that it makes learning difficult concepts seem easy. For younger kids, check out DragonBox Algebra 5+ which has fewer puzzles and focused solely on algebra. Because DragonBox Algebra 12+ turns learning algebra into a fun series of puzzles, it is perfect for kids who think they don't like math. It is also fascinating to explore if your kids do like math.